The leaves are beginning to turn bright earthen hues and there’s a crispness in the air. Fall is here, but the joys of backyard grilling aren’t over just because summer has said adieu. No, you’re just beginning to touch on all that grilling on a Big Green Egg has to offer. Cast Iron Apple Pie — Use ready made crusts or make your own. Either way, the apples steal the show. Zucchini Bread — Your autumnal squash harvest fresh from the garden and a kiss of smoke from your BGE. Smoked Apples — Enough said. Cherry Pie — Get those flavors kicked up a notch with a BGE bake! Apple-Walnut Crostata with Caramel Sauce — Fall is the time for apples galore, so it’s only fitting that we share three apple recipes, and that the last one is topped with caramel! What is fall without incredible turkey recipes for your holiday meal (or just because)? Whether you go traditional or change things up a bit, cooking that turkey on your Big Green Egg means you’ll never go back to the old ways. Who is in the mood for some of those traditional, wholesome, comfort foods that warm you to the core on a crisp fall evening? Dr. BBQ’s Roasted Upside Down Chili will have you coming back for seconds. Pair that chili with some Double Corn Cornbread! While you’re at it, shuck some more and grill up this Mexican Corn on the Cob. How about a seafood twist on a traditional favorite with Red Fish Pot Pie? Really, any of your autumnal favorite meals can be turned into something even better when done on the Big Green Egg. 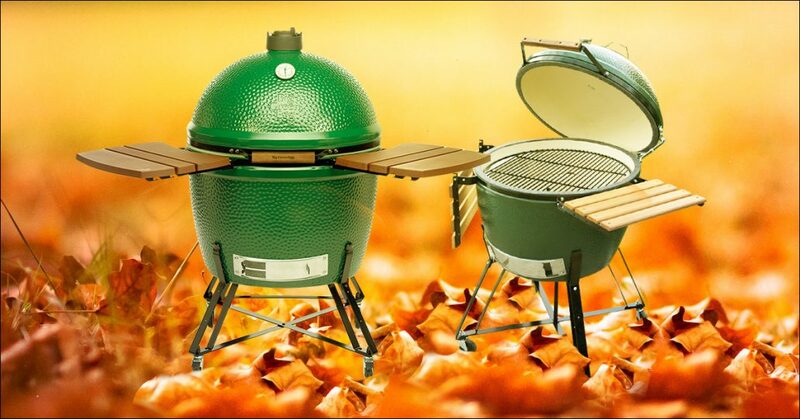 Enjoy expanding your grilling palette this fall!